Trading Forex is not so different than trading stocks or futures. There are some nuances, to be sure, but for anyone who has already been trading, picking up on these small differences would be easy. I thought I would share the background for one of the systems I teach to show people that they can understand a Forex system with little explanation and a few charts. First, understand that currencies tend to be trendy—especially on a shorter-term basis. I have observed this across many currency pairs over a number of years. There would seem to be an obvious edge in a trend-following system that can identify low-volatility consolidation patterns that are likely to break-out into a momentum-driven continuation of the trend. To take advantage of this behavior, I created a low-risk, rules-based system for times when I find that a particular currency pair is trending, respects important lines in charts, and frequently breaks out of low-volatility range consolidations. According to Tharp Think, a trading system consists of several parts: beliefs behind the system, setup & entry rules, filters, risk definition (1R), exits, and a position sizing strategy™. The following trade example gives only a short description of these parts. One of the fundamental beliefs behind this system is that price consolidations within a trend are times of “refreshers” (or pauses) required for the trend to regain strength before it can continue. Multi-bar consolidations bring price volatility down and allow for low-risk trading opportunities. The system benefits from an initial state of low volatility that allows a relatively tight stop at entry. Because the system is based on the psychology of the market participants, it works in all timeframes, from very small to large (from 1 min to daily charts). Now, let’s have a look at a recent long Busted Breakout trade in the EURUSD on the 5th of April, 2013. Overall, we see in the 60-minute chart an uptrend in the EURUSD pair determined by higher highs and higher lows. The recent strong momentum move confirms this trend and indicates that trend acceleration might take place from here on out. The moving averages are in a nice trend mode (i.e. 8>21>50>200MA). The current price is in/around the 8 & 21MA, representing a good base for the next momentum move to occur. Target levels are indicated in the chart (grey rectangles—top right) with the conservative target being the round number of 1.3000, and the more aggressive target at 1.3050 (more aggressive target). This overall chart picture might seem to present an obvious low-risk trade opportunity. A number of rules must apply for a valid entry on both the higher timeframe chart (60 minutes) and entry chart (15 minutes). Two important consolidation setup conditions are visible on the entry chart below. First, there’s a clear horizontal line through a number of bars (1.2927 in this case). Second, our break-out trader friends made a trial push lower just prior to 9:00. The breakout lower, however, failed. At this point, I started stalking the busted pattern, waiting for a definite break above the horizontal line within a certain time limit. The red candle second to last on the chart below was a nice rejection candle (testing the 21MA from above) that, although not necessary, added value to the setup. This indicated that the EUR-bulls were taking over the command of the price. The entry trigger would be the break of the high of this candle with a tight stop set at the last low (see navy blue line below the same candle). Taking into account the conservative target of 1.3000 the reward-to-risk ratio of this trade was more than 3.5 (well above my required 2:1) and I was ready for the entry. One note of caution: an important news announcement (NFP) was about to happen at 14:40 (8:30am US EST) that would likely have an impact on the EURUSD. Generally, I try to avoid trading around major news announcements, except when I am in a trade and my current stop would get me out at break even or better. Here at the entry, we were still 2 ½ hours away from this news release which left enough time (10 more bars) to make the trade at least break-even; otherwise I would exit the position before the announcement. After the entry at the 12:15 bar price break up, the Busted pattern continued to develop as expected. Price tested support at the 21MA a second time before it started off with a nice momentum move (last 4 green bull candles in the chart below). This re-break of the horizontal line from below would have been an entry if the 1st one was not taken. The stop was at a good and protected place, and we saw higher highs & higher lows forming. Look at the momentum move and think about why it happened— the market is actually running the stops of those short traders that were hoping for a successful break-down. They have to cover their shorts at prior highs which then drive prices higher towards our target. At this point, my position sizing rules required that I take off part of the position and move my stop to breakeven on the position. Now, I could relax and be grateful for a potential unexpected upside reward. By the time the news release happened at 14:40, my stops protected me from a loss and the announcement actually had a bullish impact, helping the trade reach the 1st conservative target quickly (see thick grey line on the chart below). 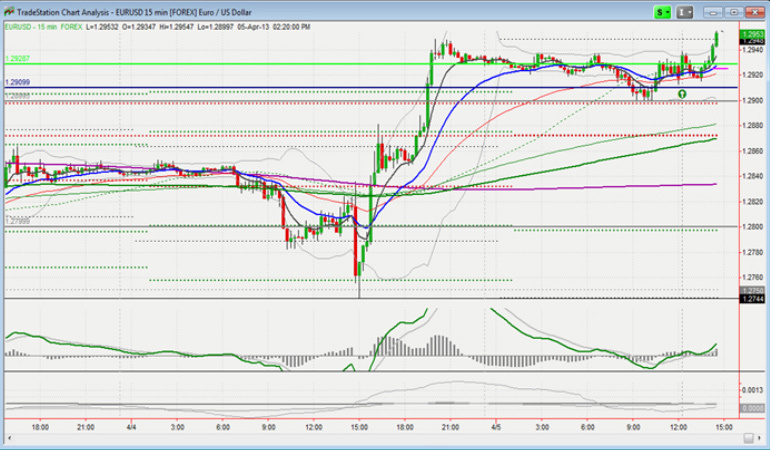 I took off another part of my position at the +3R point and left a trailing stop on the remainder—see small pink lines. Once the position gained +4R, I tightened my trailing stop by a certain percentage to preserve more of my profits. The first pullback below the 8MA led to a stop-out of the full position at 1.3011. Overall, the conservative target had been well achieved and the trade got stopped out just short of the second target. The trade generated a net positive result of +3.1R (+0.2R, + 0.8R, and + 2.1R) with limited risk exposure throughout the trade. After that trade, the EURUSD price moved back to the MAs on the 60min chart and things got interesting again. A nice, green rejection candle squeezed within the 8/21MA is about to trigger the next potential trade using another system whose trades last a little longer because it uses hourly bars only. I teach this system in the Forex workshop. As you might have noted with the trade example and the setup example above, these “Forex” trading systems may look familiar. One of my beliefs is that: “a chart is a chart,” and as such, the same system logic can apply for all timeframes, Forex pairs, and instruments beyond Forex.